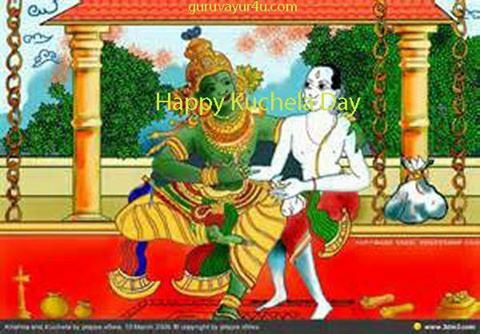 Kuchela Day is observed on the First Wednesday in the sidereal month of Sagittarius, Dhanu. Kuchela, knowing that temptations from Wealth, Wine and Women can bring sorrow, shunned the Business Path. He was in poverty as a result, but he continued to be a Yogi. On this day, he gave Lord Krishna, his childhood friend, beaten rice, Avil and the Lord blessed him with both bhukthi, material prosperity and mukthi, eternal salvation ! Offering Avil on this day to the Lord of Guruvayur is considered very auspicious ! The poet Melpathur wrote about this story thus. Kuchela met the Lord, who welcomed him graciously. Krishna grabbed the first bag of Avil and ate it voraciously. He then extended His Hand for the second bag and then Rugmini caught hold of His hand ! When Kuchela returned home, he could not believe his eyes. A golden palace stood where his hut was. " How strange Thy Grace" exclaimed he ! But he continued the Fourfold Yoga ! And ate it with glee ! Vichitra Roopa sthava khalu Anugraha ! Vichitra Roopas Thava Khalu Anugraha! Bubodha Thval Karunam Maha Atbhutam ! O Master of Bliss ! Beloved of Gopis ! In the mighty inner war ! Thonnename Varada Narayanaya Nama ! What are the 64 Arts ? There are 16 Kalas ( 15 Lunations + Transcendence ) for the Moon and states are 4 ( Sattwa, Rajas, Tamas, Shuddha Sattwa ) and so 16*4 = 64 ! (44) suka-sarika-prapalana (pralapana) -- art of maintaining or knowing conversation between male and female cockatoos. (47) akshara-mushtika-kathana—art of talking with fingers. (48)dharana-matrika—art of the use of amulets. (52)mlecchita-kutarka-vikalpa—art of fabricating barbarous or foreign sophistry . Guruvayurappa ! Thava Suprabhatam . Good Morning to Thee ! What is Shukra Deepam ? It is part of the Lamp with Nine Wicks, Nava Griha Deepam.